Wynn Godbold, the founder of the International Academy of Bee Sharp Teachers, recently released her first teacher help book. How to Be a Great Teacher: Create the Flow of Joy and Success in Your Classroom is now available online. Unhappy teachers, overwhelmed teachers, and frustrated teachers fear not. A new book recently hit the online marketplace to help alleviate the stresses of teaching. 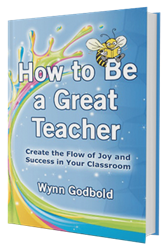 “How to Be a Great Teacher: Create the Flow of Joy and Success in Your Classroom” is a new teacher help book by Wynn Godbold, founder of the International Academy of Bee Sharp Teachers. The book explains why the current paradigm in education sets teachers up for feeling overwhelmed and frustrated; then proposes a new paradigm for teachers everywhere to follow. Following the paradigm explanation the book jumps into a 9-step process helping readers on “How to be a Great Teacher.” The steps are broken into three major categories – Decide, Believe, and Share. To order “How to Be a Great Teacher” on Amazon visit http://www.amazon.com/dp/1492399205/ref=cm_sw_r_tw_dp_gT.8sb0TVEVF6QMH. To learn more about the Bee Sharp Academy please visit http://www.beesharp.us. Wynn is a speaker, trainer, administrative coach, and expert in joyful teaching. She is passionate about empowering educators to release their feelings of overwhelm and frustration and find the balance they need to flourish in their calling. Her teacher retreats are known to empower teachers to love their lives. Teachers worldwide experience personal growth through the products and packages she offers on line. In June of 2012, Wynn kick started the International Academy of Bee Sharp Teachers. Wynn is Nationally Board Certified in Reading and the Language Arts. She has certifications in Education Administration, Elementary and Early Childhood Education. In addition to running Bee Sharp, she consults for the McGraw Hill Education Group and serves on the Educational Team at Page Turner Adventures.